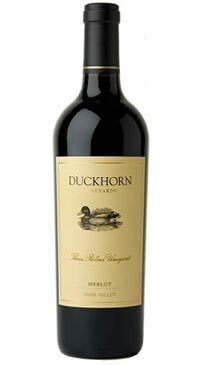 Since the inaugural vintage in 1978, Duckhorn Vineyards has been proud to craft a vineyard-designate bottling from Three Palms. One of California’s first single-vineyard Merlots, this full-bodied wine reflects Three Palms’ unique terroir and has been a consistent benchmark for New World Merlot. Named for its three iconic palm trees, the warm, up valley vineyard features lean soils that cause the vines to send their roots deep in search of nutrients, producing an intense, age-worthy wine with complex fruit and mineral layers. The wine is a blend of 89% Merlot, 8% Cabernet Sauvignon, 2% Malbec, 1% Petit Verdot aged in 100% French oak barriques (227L) for 18 months; 75% new oak and 25% Neutral oak. The 2013 growing season yielded a riveting expression of Three Palms Vineyard Merlot, with a rich entry and pure and polished flavors of cherry, cassis, pomegranate, and blackberry. On the palate, these gorgeous fruit elements mingle with complex layers of leather, wet river rock, eucalyptus and black tea. Warm earthy notes finesse the finish while dense, fine-grained tannins provide wonderful length. Combines good structure with a supple texture, showing aromas of red currant and dark chocolate and layered flavors of cherry, spice and licorice. Drink now through 2028. 3,770 cases made.